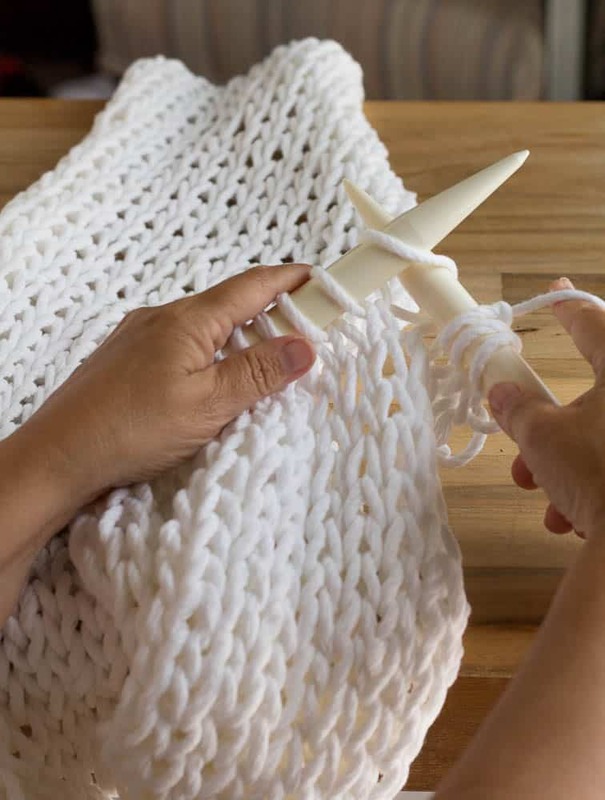 This knitted table runner is knitted with bulky yarn and large knitting needles and is super easy to make. This table runner can be knitted in just a few hours. My husband and I built this zinc top table ourselves and it was the first piece of furniture that we have ever built. I love it so much! You can view our tutorial for the zinc top table. We wanted a very large table so that we could entertain friends and family. The problem with our 8 foot kitchen table is that there is not a table runner out there to fit it. This post contains affiliate links for your convenience. You can see full disclosure policy. I knew I would have to make a table runner so that the runner could hang off the sides. I love the chunky knitted blankets that I have been seeing on Pinterest and I thought that I could knit a table runner using the same technique. I used 4 skeins of chunky yarn in the color white. This is for an 8-foot table so you will use less if your table is smaller. This runner would look beautiful in cream or gray also. 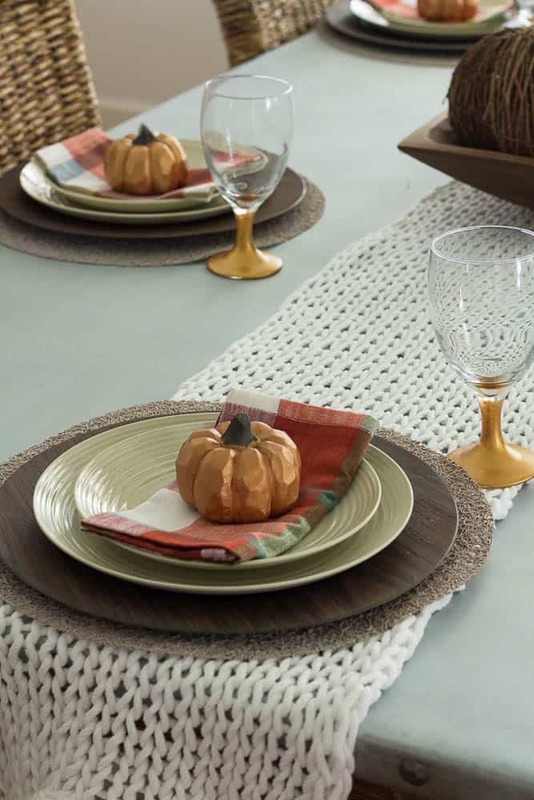 I love that the runner looks warm and cozy so it is perfect for a fall or Christmas tablescape. THE YARN I USED IS THE BOTTOM YARN IN THE PICTURE (I used the color white but the one in the picture is ivory). I wanted to give you an idea of the size yarn I used. I used Yarn Bee from Hobby Lobby 60% Cotton 40% Acrylic. It is 3.5 ounces and 54 yards. I have also seen yarn the same size at Michaels and Walmart. It says that Size 11 Knitting Needles are recommended but I used US 35 needles and that’s why it looks loosely knitted. The yarn I used looks thicker than regular yarn but it is not the huge yarn that people are arm knitting with. 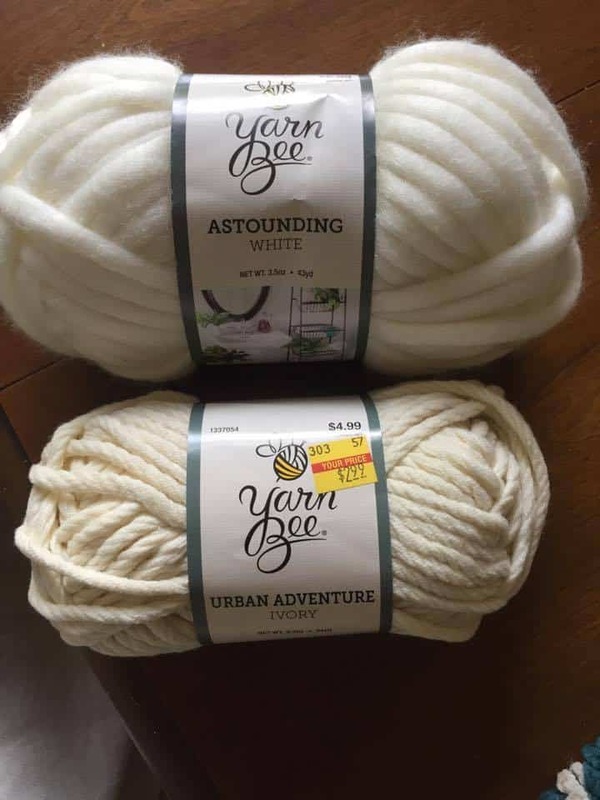 You may not find the exact yarn I used because this was on clearance but I see lots of the same yarn in this size everywhere. 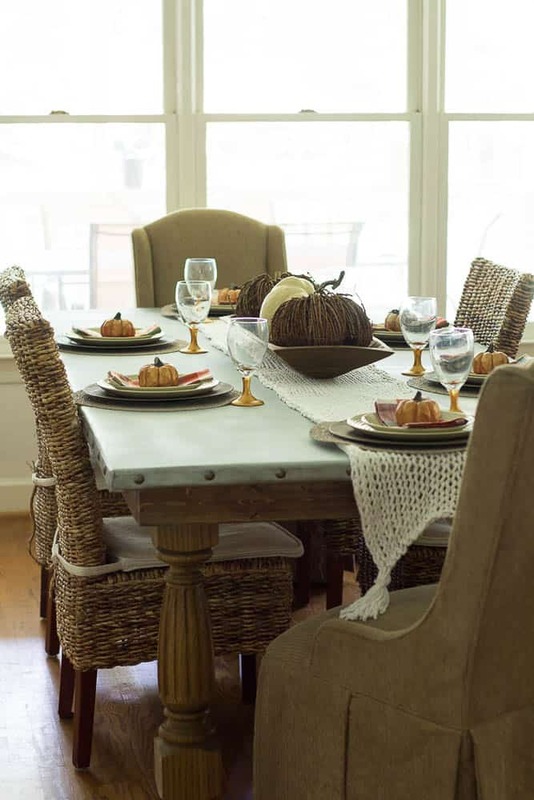 You need to use a thicker and firmer yarn so that the sides of the table runner do not roll up as you knit. I cast on 14 stitches but if you want to make it wider, cast on a few more. I didn’t want it too wide because I usually use large round placemats and did not want the place mats to cover up my beautiful runner. I used large size 35 knitting needles. I love knitting with large chunky yarn and large needles because it knits so quick. Knit the runner as long as you need it to be. Bind off the edges. You can add tassels or pom poms and embellish the runner any way you like. Cast on 14 stitches. You will be working in stockinette stitch. Repeat this until the runner is the length you desire. Here is a tip if you make tassels. Use something square or rectangle to wrap your yarn around so that you will have even tassels. I love this beautifully knitted table runner so much. It is super quick to knit, looks beautiful on the table, and it is washable! 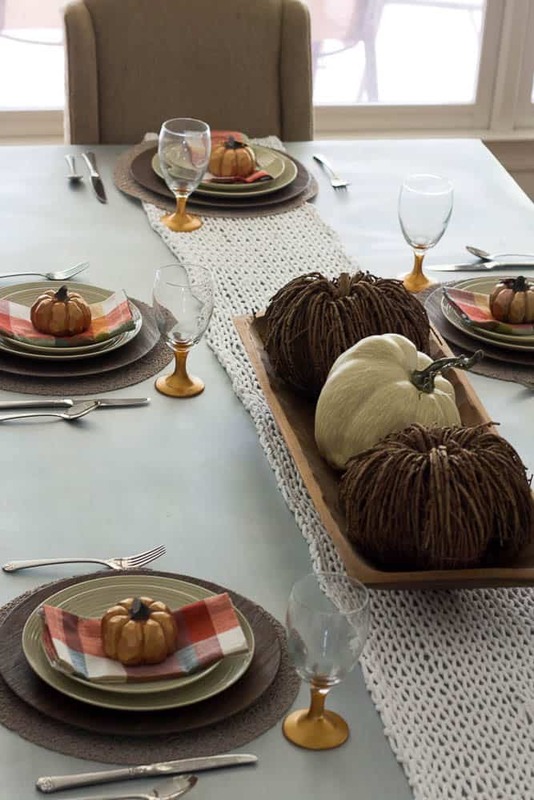 Visit the post to see my Fall Tablescape and also the other talented blogger’s fall tables. This is so cute! 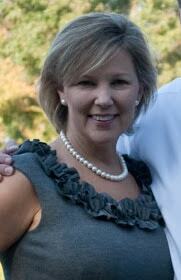 Happy to have found your Blog:) Great ideas and inspiration! Oh, I just love this – fabulous texture! I will be making this soon. Thanks so much for the inspiration! Hi Susan! I used Yarn Bee from Hobby Lobby 60% Cotton 40% Acrylic. It is 3.5 ounces and 54 yards. I have also seen yarn the same size at Michaels and Walmart. It says that Size 11 Knitting Needles are recommended but I used US 35 needles and that’s why it looks loosely knitted. The yarn I used looks thicker than regular yarn but it is not the huge yarn that people are arm knitting with. I am going to email you a picture of the yarn so that you can see the size and I will add the picture to this post. Thanks for asking this question because I need to put this information on the post. Good Luck with your table runner! Love this table runner to bits! this is such a unique take on a table runner. it’s soft and such a pretty texture! love! It has been a while since I knitted. I am looking forward to start this project soon. I need to make at least 4 by thanksgiving. It has been a while since I knitted. I am looking forward to start this project soon. I need to make at least 4 by thanksgiving. How long is your runner? Hi Diane! My table is 8 feet long so I knitted the runner 10 feet. If you can’t remember how to knit, you can watch YouTube videos to show you how. 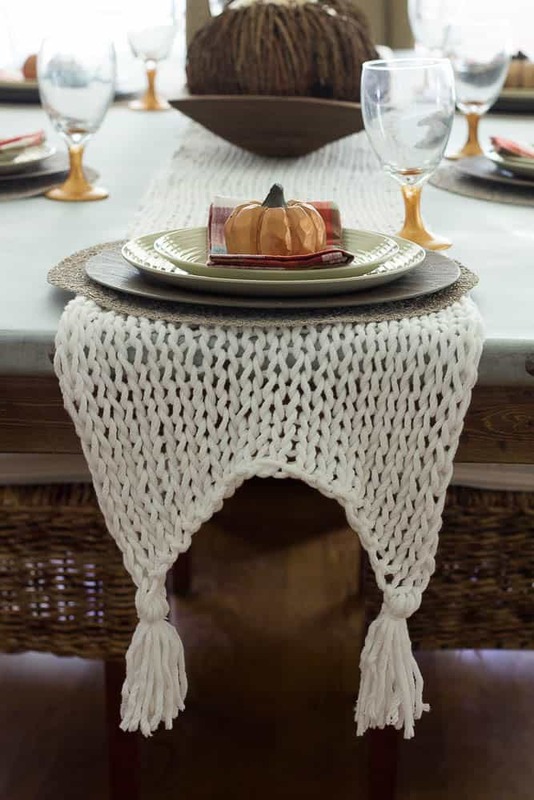 One of the best fall table runners I’ve seen Sherry. How very clever of you!! Thank you for linking up at Create, Bake, Grow & Gather this week. I’m delighted to be featuring your knitted table runner at tonight’s party and pinning too!! Kerryanne, Thank you so much for the compliment and for featuring my knitted table runner. This makes my day! Here from The Shabby Art Boutique, I LOVE your gorgeous table runner!!! I love this idea my dining table is antique and not a standard size so I have a hard time finding table runners the right size. I don’t know how to knit but I can crochet are there crochet hooks large enough for the thicker yarn? Am I missing this pattern? Sorry I can’t find it anywhere. Hi Gina! I added the pattern in the post again so it is easier to see. Repeat this until the runner is your desired length. How did you tie the end and add the tassles? I really want to make this but can’t figure out your ends. Thank you so much. I am so impressed with this magazine and I will be sharing it!! Hi! Your tassels hang better than mine. I can’t connect my photo, but can you tell me how you connected yours? Mind look very disshoveled. Thanks! I ran a piece of yarn through the top of the tassel and I tied it to the very corner of the runner. I am thinking that maybe my tassel is heavier than yours or not as heavy and that is why it is hanging differently. I hope this helps.